“Cost shifting” from higher levels of government and a small population are to blame for Kangaroo Island Council’s inability to maintain public infrastructure, Mayor Peter Clements says. Clements told InDaily his “unsustainable” council does not have the “critical mass” of ratepayers needed to keep up with the escalating deterioration of the island’s roads. “We just don’t have that critical mass of rates,” he said. He lamented that “the Kangaroo Island Council and the Kangaroo Island community has been in an unsustainable position for decades” and needed short-term population growth to ensure there is enough revenue for the council to maintain public assets. He stressed, though, that his council was not in “a perilous state with cash”. “At the end of every year we end up with a cash surplus,” he said. Clements said that despite the council’s financial problems, it was “very, very reluctant to increase rates” because they were already above average, and increasing rates further would not be fair on the population of Kangaroo Island, which earned wages that were below the South Australian average. “We could become instantly sustainable if we were to double our rates, but that’s just not fair,” he said. He said besides attracting new residents, the council had to look for new sources of revenue, including becoming involved in energy generation on the island. Kangaroo Island Council. 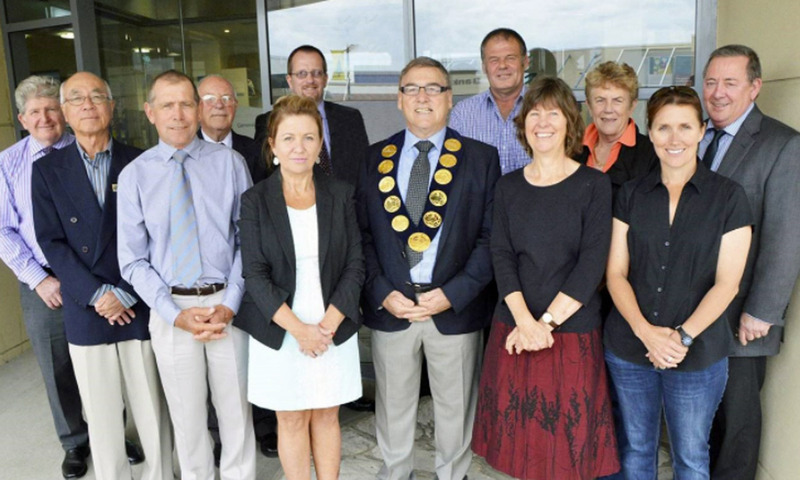 (Left to right) Graeme Connell (resigned), Ken Liu, Deputy Mayor Graeme Ricketts, Peter Denholm, Cathie Tydeman, Andrew Boardman (CEO), Mayor Peter Clements, Larry Turner, Pip Masters, Joy Willson, Sharon Kauppila and Ted Botham (Director Council Services). During his interview with InDaily, Clements accurately predicted that “our local member [Liberal MP Michael Pengilly] will argue that the council hasn’t been thrifty enough and it wastes money” – but added that “that’s not the case at all”. Pengilly, who last year used parliamentary privilege to call for the council to be sacked, told InDaily yesterday that the reason for the council’s financial woes was that “they haven’t cut their cloth to match their suit”. “The standard local government line is blaming the state and federal government,” he said, adding that the council had too many high-paid employees. But Clements argued his council had always been careful with ratepayer money and that besides the island’s low population (about 4500 residents) “cost shifting from the state and federal government” was to blame for the council’s inability to keep up with infrastructure maintenance. “Councils are not given sufficient financial resources for their responsibilities to assess development applications, regulate animals, manage contaminated land, control noxious weed, manage flood controls, or administer environmental regulation,” he said. “The cost of financial compliance for local government has increased over the past two decades partly due to a risk averse first and second tier government, and an over-reaction to a minority of … councils experiencing financial difficulties. The mayor, who was elected in 2014 after serving four years as deputy mayor, said councils made “no lesser level of errors than it did 20 years ago … it just costs us more to make them”. He joked that “with every level of compliance, we get another opportunity to make mistakes”. But a State Government spokesperson told InDaily in a statement this morning that the government was providing millions of dollars to support the island and its council. “The State Government is committed to unlocking the economic development potential of Kangaroo Island,” the spokesperson said. “$30 million over ten years has been committed to support councils to accelerate spending on local community infrastructure projects. “The State Government has an ongoing commitment to provide $2m annually to fund road maintenance activities on the Council maintained unsealed road network on Kangaroo Island,” the spokesperson said. But Clements said it was time to get rid of state governments altogether. “The removal of State Government and the formation of Regional Governments, incorporating the efficiencies and value for money [of] local government would be a brave but productive step,” he told InDaily. Clements added that though Kangaroo Island’s population and economy needed to grow in the short term, it would reach a point after which continued growth is unsustainable. He said he was an advocate of an eventual “steady state economy” for the island, which he said involved assigning value to “every tree and every blade of grass”. He said he wanted Kangaroo Island to “reach a point in time where the island has peaked as a single entity – economically, environmentally and socially”. “We want to cap the growth of Kangaroo Island so that we can have an economy that works extremely well without many fluctuations,” he said.